On Monday, March 7, at 11:30 a.m., more than 3,000 students from schools all across the Boston Public School District stood up from their desks and joined their peers in front of the State House to protest a proposed $50 million cut to the 2016-2017 school year budget. Armed with protest signs, rally chants and the hashtag #bpswalkout, students took an important step in voicing their opposition to budget cuts that threatened to eliminate subjects and resources from their schools. 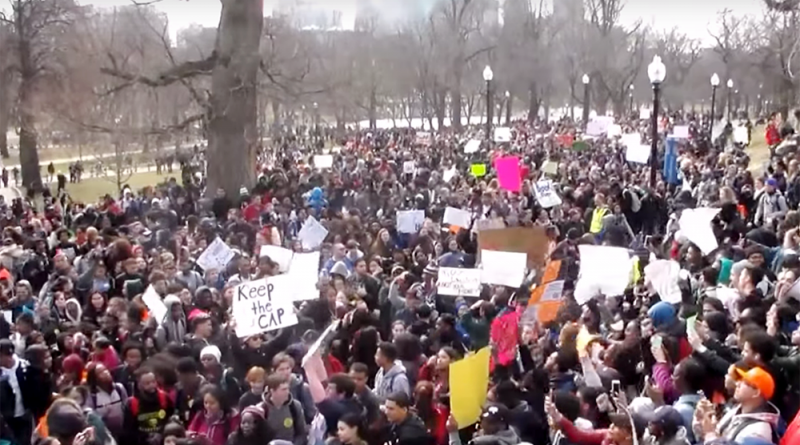 Mayor Marty Walsh initially reacted dismissively to the protests, highlighting that it was wrong for students to skip class for the walkout. Mayor Walsh went on to question whether the students were the true organizers of the movement and chastised potential suspects for encouraging students to abandon their studies to score political points. As time passed, it quickly became evident that this was a student-led protest, initiated by a group from Snowden International School that was organized over the course of ten days. What started as a simple one-page call to action on Twitter became a district-wide movement organized through text message and social media. Three days after the protests, Mayor Walsh changed his tune and commended the students for their advocacy, announcing that through a reallocation of resources, Boston high school budgets would be slightly increased from the previous year despite moving forward with the planned cuts in the education budget overall. In a presidential election season that has, in large part, been defined by populist rhetoric from candidates on both sides of the aisle, the story of the Boston Public School (BPS) students provides a real-life example of what can be achieved through grassroots mobilization. A group of teenagers—whose age precluded them from voting—from a school district where the majority of students are minorities and 78 percent come from low-income families was able to reverse the high school budget plans for one of the largest school districts in the United States. While this may seem like an outlier in the world of politics and policy, there are many big and small examples of constituents coalescing around local issues that have an outsized impact on their daily lives. That’s because local government is ultimately responsible for the provision of basic services like education, transport, water supply, policing and taxes. Local governments tend to be run as “managerial democracies,” leading to less biased resource allocation, higher sensitivity to constituent preferences, and overall diminished partisanship, as political scientist Eric Oliver points out in his book Local Elections and the Politics of Small-Scale Democracy. Despite evidence demonstrating the impact of local policy on its constituents, we see fewer people voting in local elections with each passing year. Researchers from the University of Wisconsin compiled election data from the 144 largest U.S. cities and found that the overall trend is a steady decline in voter turnout, particularly in off-year elections. In 2011, average voter turnout for local elections was just 20.8 percent of the total voting population. Structural impediments, such as off-year elections and nonpartisan, noncompetitive contests help to explain this declining voter turnout. But a larger issue is at play here. The U.S. voting population is notoriously apathetic, particularly compared to other developed nations. In 2012, only 53.6 percent of the voting population turned out for the presidential election, ranking the U.S. 30th out of the 34 OECD nations in voter turnout. This sense of apathy is only heightened during local elections. This apathy has consequences. Low turnout and uninformed voters means elections for local officials remain uncompetitive, leaving incumbents in office regardless of their track record. Even when local elections coincide with midterm or presidential elections, voting is frequently based on party affiliation, which can often be a mismatch between party loyalty and what is right for local governance. What can be done to reverse this trend and show constituents that local-level engagement can lead to responsive action and meaningful change? The responsibility of facilitating dialogue through constituent feedback lies with local governments and officials. This engagement has typically come in the form of public hearings and more recently participatory budgeting, a process that allows citizens to help determine the allocation of budget resources. By allowing for participation in the civic process to go beyond casting a single vote, local municipalities can demonstrate to their constituents the influence of their voice in the community. While an important lever in civic engagement, these types of in-person forums are typically attended by those already engaged in the process. This is why more and more governments are starting to use technology to help increase and diversify participation. The platform Textizen is now being used in more than 40 cities to collect feedback on policy issues and projects through the dissemination of surveys via text message. This simple and time-efficient method has potential for not only helping elected officials understand the pulse of their municipality but also generating a dialogue that keeps citizens continually informed. Ultimately an increase in public meetings or development of new technology cannot achieve the level of civic engagement necessary to produce the best policies and increase trust between citizens and government. A culture of engagement will only develop if constituents are educated about the avenues for participation in their community. For the students who organized the BPS walkout, one experience helped inspire their engagement. Three walkout organizers attended a conference for high school students organized by the Student Public Service Collaborative at Harvard Kennedy School. The conference focused on empowering students to make change in their community. Other leaders in the movement learned about methods for social change through their involvement in the Boston Area Youth Organizing Project, a non-profit committed to improving the lives of youth through empowerment and political action. The hands-on exposure to civic engagement processes combined with their ambition and talent resulted in a powerful demonstration of civic participation. This, in turn, provides hope to other students that vocalizing their needs to local government can make a tangible difference. While these students have taught Boston an important lesson in civic engagement, it is clear that Boston owes them a higher-quality education system. A culture of participating in local government will only be developed through an education that puts the ideas of democracy into practice through seminars on the roles and capabilities of the government as well as actions that citizens can take to influence government decisions. This education, combined with more traditional outreach and an increased use of technological communication technology, will be what propels local government into the next era of citizen participation. Chante Lantos-Swett is a Master in Public Policy ’17 candidate at Harvard Kennedy School and research assistant at the Ash Center for Democratic Governance and Innovation. Prior to the Kennedy School, Lantos-Swett worked with non-profit organizations in California and Washington, D.C., to promote the creation and use of technology for education and civic participation for the United Nations’ new Global Goals.